Extraordinary performance, sportiness and pure, environmentally responsible driving fun. Its name is H2 Speed and it is Pininfarina's innovative vision of a high performance track car based on revolutionary hydrogen fuel cell technology already subjected to severe track testing by GreenGT, a Franco-Swiss company which has been designing, developing and producing clean, sustainable propulsion systems since 2008. H2 Speed will appeal to passionate people who love speed, performance and innovation and, at the same time, are attracted by the exclusivity typical of a Pininfarina-designed vehicle produced in a limited series. 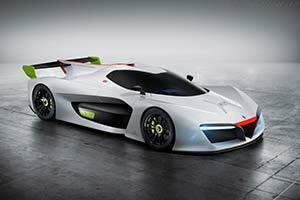 Halfway between a racing prototype and a production supercar, the H2 Speed is the world's first hydrogen, high performance car. It is not by coincidence that its name joins together H2, the formula for gaseous hydrogen, and the English word Speed, as if to say that it is the force and energy of Nature that generate the vehicle's high performance, fostering the excitement that is typical of passion and sport. Sculpted by efficiency-boosting aerodynamics, the H2 Speed weds blistering performance to refined lines and shapes integrated in a form of strong emotional impact which embraces the driver and represents the best possible expression of Pininfarina DNA: purity, elegance, innovation expressed through the passion that has always pervaded the world of high performance cars. Global styling benchmark for 86 years, Pininfarina has always invested in research and development programmes to propose concepts and innovative solutions to the new challenges that continue to arise in the car industry. One of the main areas was that related to performance and to aerodynamic and technological innovation for racing, as seen in the Lancia Aprilia Aerodinamica of 1937, the Fiat Abarth Monoposto Pininfarina Record of 1960, the Dino 206 Competizione of 1967, the Lancia Beta Montecarlo Turbo Gruppo 5 of 1978. In this context, however, the most striking example was the Sigma Grand Prix of 1969, which reinterpreted and renewed the Formula 1 concept by introducing major safety content geared to drastically reducing the risk component inherent in car racing. Starting from these examples, in a scenario of great attention to the most sensitive aspects of sustainability and emissions reduction, Pininfarina today proposes a new interpretation of its passion for motor car performance in an innovative and totally ecological key. For this new styling and research exercise, it has used the hydrogen fuel cell technology developed by its partner GreenGT. The technology presented by GreenGT is the substantial outcome of a two-year development and testing programme that has embodied the form of the H2 Speed concept. GreenGT proposes 'Full Hydrogen Power' technology, a powerful electric-hydrogen fuel cell drive chain. The result is a zero emissions vehicle able to reach 300 km/h by releasing just water vapor into the atmosphere. With a maximum power of 503 horsepower, the engine accelerates from 0 to 100 km/h in 3.4 seconds. Also notable is the rapid refueling, unknown to traditional electric cars: a full tank of hydrogen can be done in only 3 minutes. H2 Speed eliminates both air and noise pollution. The compressor gives the vehicle's engine a very special tone, completely different to that of conventional electric cars. So even the noise made by the car is close to the emotion of silence, sounds and hisses that evokes science fiction.